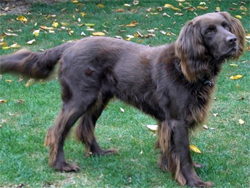 The Deutsch Langhaar, or German Longhaired Pointer, is a very good versatile hunting dog with good tracking, water and upland pointing skills. The Deutsch Langhaar is a natural retriever as well. It has a longer coat that will take some grooming after a day in the field. They only make good pets when properly exercised, as they need a "job" to do, and do not adapt well to a sedentary life. 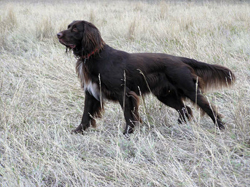 The Deutsch Langhaar is a very trainable dog and loyal to its master and family. The Deutsch Langhaar is an excellent family pet, as it enjoys playing with children, and it is very sociable with dogs. The true Deutsch Langhaar blood lines have been preserved through the strict breeding and testing programs regulated in Germany. Additional breed information for the Deutsch Langhaar can be found at the Deutsch Langhaar Gruppe Nordamerica website.